Ten affordable homes for rent including two bungalows and one for shared ownership house for purchase. The scheme was born out of a Housing Needs Survey. Ten affordable homes for rent including two bungalows and one for shared ownership house for purchase were incorporated into the development based on available land. The Parish Council and wider community were keen to see a development of local needs homes. As a community they recognised that high house prices and the lack of adequate affordable homes was affecting the sustainability of the village with some being forced to move out of the village. The community were involved in identifying potential sites, eventually settling on the Poachers Close site, off Kettering Road, on the basis of a willing land owner and being the preference of the Local planning authority. The Parish Council were very keen to be involved not only in the site selection but in the design of the homes. The block paved courtyard theme with a mix of brick and render finish, Victorian style windows and canopy porches were all favoured by the Parish Council. The site being on the edge of the settlement is classified as a Rural Exception site. As such, the evidence base for the planning application was based on the Housing Needs survey results. The allocations of the homes are driven by the S106 planning agreement, priority is given to local people of Walgrave and then on a cascade to surrounding Daventry District parishes. All of the homes were allocated in line with the S106 agreement and the community were very happy with the outcome, so much so that they have recently commissioned a further housing needs survey. The Parish Council was fully involved in site selection and design of the scheme. A full public consultation was staged in the village hall providing an opportunity for the village to comment on the proposals, ask questions and provide feedback. Comments forms were provided and a report was fed back to the community based on the comments. It was fair to say that the proposals received very broad support. 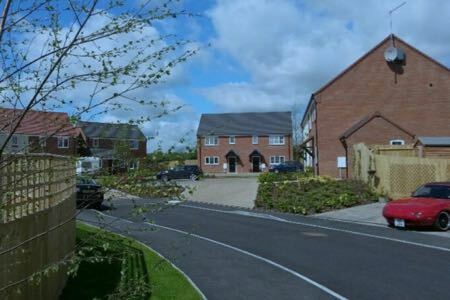 The whole Walgrave community were invited and many attended a special event allowing local people to view the homes before residents moved into the development. County, District and Parish Councillors attended as well as many local residents, all were very impressed by the space, quality and finish of the homes. “I love that we can see fields out of the window and that it’s such a peaceful place. We’re very grateful for our new home which will enable us to live as a family, with the support we need close by.” Cherry Hills and her partner, Liam are enjoying a new start in a new home with their two- year-old daughter, Lily Rose, thanks to Northamptonshire Rural Housing Association (NRHA). When they were offered a two bedroom home, they were delighted. To ensure the house fully meets their needs, a stair lift has been fitted and the bathroom has been adapted to a wet room. Now Cherry, Liam and Lily Rose are getting settled into village life.